From the private papers of the late Mrs Dorothy Beedham. John William Sutton at home in Wiltshire. John Wm Sutton is one of the men named on the Bottesford ‘church list’ of WW1 Servicemen. He was remembered by the late Mrs Dorothy Beedham, whose papers have been essential in preparing these brief biographic notes. 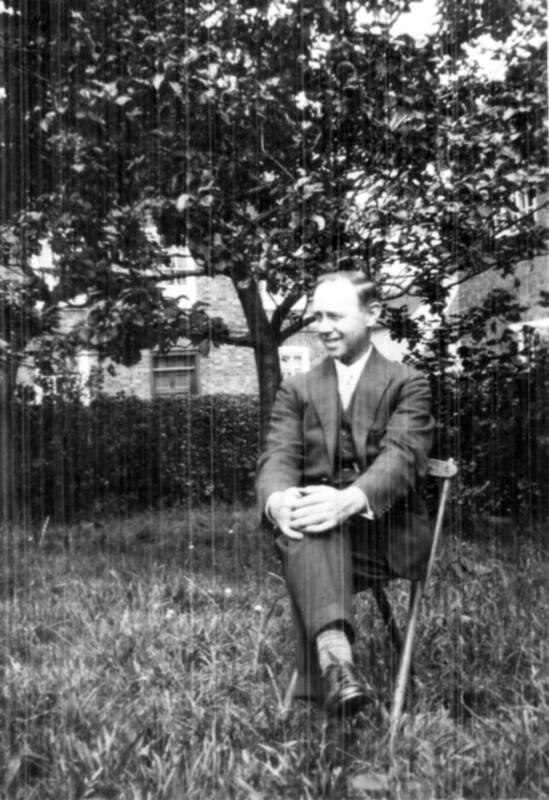 John William Sutton was born in 1884 and baptised at Bottesford on the 4th January, 1885. He was the older son of William and Eliza Sutton, who kept a grocery shop on High Street, Bottesford. William Sutton was born in 1833, and married Eliza Lilley, 22, on the 23rd October 1866 at Bottesford. In 1891, at the grocery shop there were four children, John William (6), Philip (4), Jane (3) and Ann (1). Philip Sutton would join the Durham Light Infantry in WW1, and tragically lost his life 24th March 1918. Searches of the 1901 and 1911 censuses have been unable to determine John William’s whereabouts or occupation in the pre-war years. 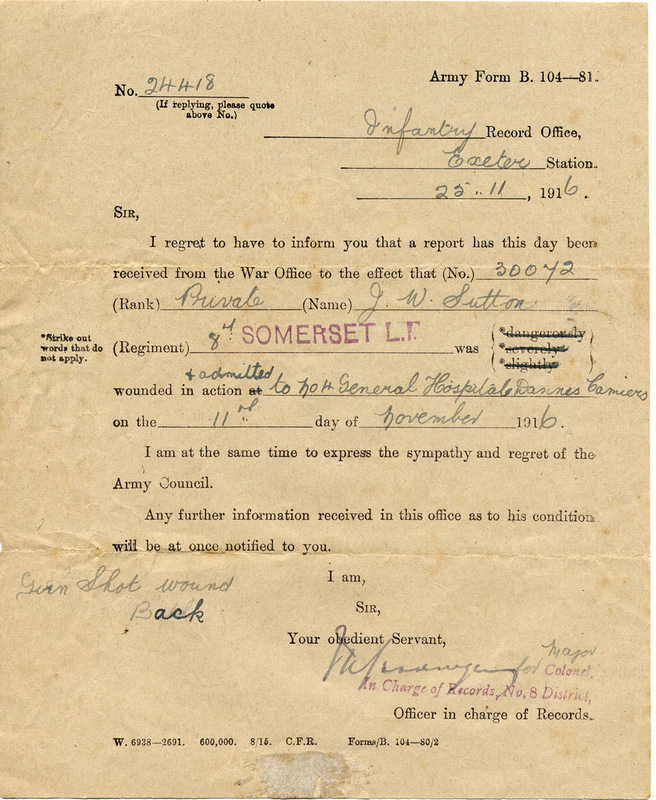 John William Sutton served as Private 30072, 8th Battalion, Somerset Light Infantry. 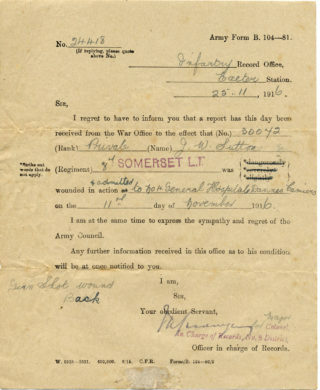 No other details are available, except that an official letter, among Mrs Beedham’s papers, reports that he was admitted on the 11th November, 1916, to hospital in France (No.4 General Hospital, Dannes Camiers) with a gunshot wound to his back. He survived the war and lived in the Swindon area, Wiltshire. A note in ‘Em’s Tree’ (Ancestry Public Family Trees) states that his sister, Jane, died in 1964 at Melton Mowbray, when John W. was 79 years old. John WIlliam Sutton died at Swindon in 1977, aged 82.